Pinball is a type of arcade game. 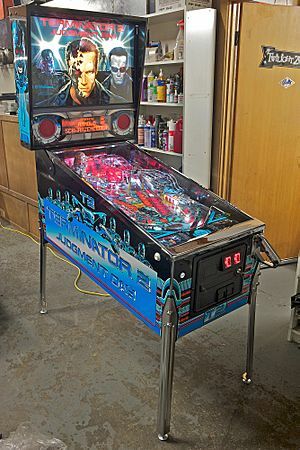 In pinball, the player tries to score points by manipulating one or more metal balls on a playfield inside a glass-covered case called a pinball machine. The main objective of the game is to score as many points as the player can. Other objectives are to play as long as possible (by earning extra balls and keeping the ball in play as long as possible) and to earn free games (known as replays). 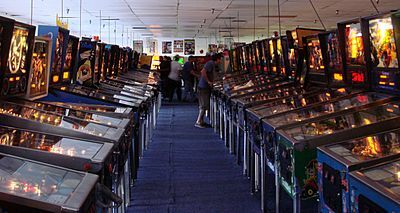 From the 1940s through the 1970s pinball was banned in many American cities because it was thought to be a game of chance and therefore was considered gambling. The ban stopped in New York City in 1976, when Roger Sharpe, a player renowned for his talent, played so well in front of the City Council that he convinced them that pinball was indeed a game of skill, not just of luck. Pinball Facts for Kids. Kiddle Encyclopedia.